This is an exciting time for patient and public involvement (PPI) in health and social care research internationally. PPI is a rapidly growing, important global movement aspiring to produce better and more relevant research resulting in services and treatments that patients and the public need. Patient and public involvement in research can be defined as research being carried out ‘with’ or ‘by’ members of the public rather than ‘to’, ‘about’ or ‘for’ them (www.invo.org.uk). We recognise that some countries and organisations use different terms, including ‘public engagement’ to mean this same activity, but for the purposes of this survey we will use the term 'Patient and Public Involvement' (PPI). 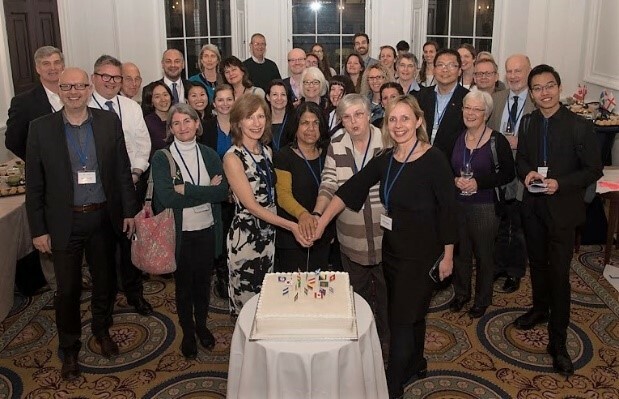 For this reason, a number of organisations and individuals came together to form the International Network for Public Involvement and Engagement in Health and Social Care Research. The Network was launched in London on 27th November 2017. Thirty-three representatives from ten countries joined the meeting. Participants ranged from PPI ‘practitioners’ and managers, involved members of the public, researchers, policy makers, and health professionals. The second Network meeting took place in May 2018 and was an exciting blend of presentations on the challenges and opportunities for consumer and patient involvement globally. The meeting was held physically at the Royal Society in London and online to enable global participation. You can read our blog post here and view the presentations here. There was also a Special Session at the 25th Cochrane Colloquium. Vision: A world where patient and public involvement is an integral part of health research. Mission: Working together we will build a global partnership that shares knowledge and promotes, supports and strengthens patient and public involvement in health research. The Network is actively considering its business model, writing a communications strategy including developing a website, social media plans and a webinar programme, and beginning to encourage collaboration, for example by supporting the forthcoming Global Patient Engagement Symposium organised by Alberta SPOR. Over 200 organisations and individuals worldwide have already expressed an interest in joining the Network, from Australia to Zimbabwe. We are still seeking your views and comments on our intent, the priorities for the network, as well as your expressions of interest to be part of this Network. You are warmly invited to complete the survey. Taking part in the survey will take up to 15 minutes to complete depending on how much you have to tell us. If you are aware of other national or international PPI organisations that might be interested in being part of this network, please do feel free to send them the link to this survey. If you have any questions relating to the survey or the international network, please contact Richard Morley by emailing rmorley@cochrane.org . Richard will respond on behalf of the Network development group.